In this 185th issue of the Baba Indaba’s Children's Stories series, Baba Indaba narrates the tale of “Fairer than a Fairy.” A royal couple have a beautiful daughter late in life and name her Fairer Than A Fairy which incensed the Fairies. They decided to remove her from the sight of mortal men and a spell is cast. 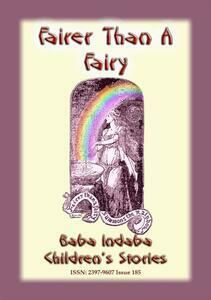 Fairer Than A Fairy disappears and is taken to the Kingdom of the Fairies. The eldest of the fairies, named Lagree was assigned to look after her. Fairer than a Fairy resides in the fairy kingdom for many years and grows into a beautiful young lady and forgets her father and mother. One day, whilst passing near a fountain in the garden, she noticed that the sun's rays fell on the water in such a manner as to produce a brilliant rainbow, and is astounded when the rainbow starts speaking to her and a relationship develops. ..................……. Download and read this story to find out what happened when the fairies find out that Fairer Than A Fairy is not as lonely as they think.